Yarn Type Super soft to the touch and beautiful in the knitted fabric, made with angora, wool and polyamide for strength, this yarn will knit to create a garment that will be a joy to wear. 66% super kid Mohair, 27% Silk, 4% Polyester, 3% Nylon. Hand wash cold. Interchangeable with Kidsilk Haze and will knit to all the archive patterns. 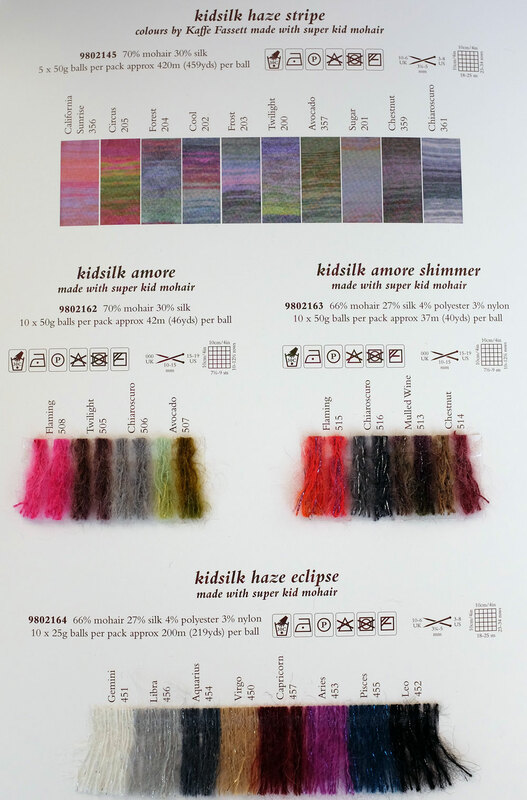 Palette for the yarn taken from the best selling shades in Kidsilk Haze and Lurex is tone on tone.